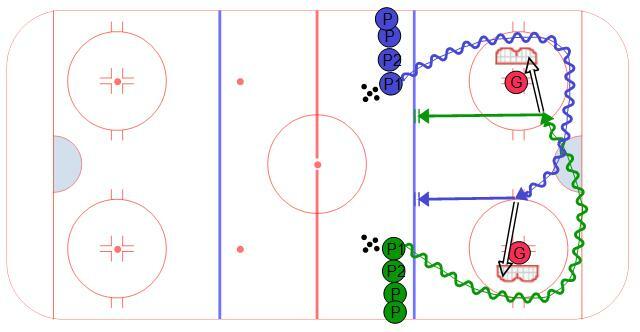 Here is a hockey drill the young ones will LOVE! It works for half ice as long as you have two nets. Split the players into two teams and have them line up along the blue line so the first player is even with the face off dots. The objective is to be the first team stopped along the blue line and in good hockey position. On the whistle the first player from each line takes a puck and crosses over behind their own net and then goes down on the other goalie in a 1 on 0. Players need to keep thier head up because their is another player coming the other way. The player has to score on the other team's goalie and then skate to the blue line, stop, and stay in good hockey position. Once the player stops, the next player on their team can go. The first team to get all of their player in good hockey position along the blue line wins.